Bad at Sports is pleased to present our second guest blogger this week, Jen Gillespie. Jen is a local Chicago artist. She enjoys a thirsty mind with a taste for critical theory, diagrammatic oversimplification of narrative, heartstrings, and the uses for Lacanian psychoanalysis in explaining identity relationships. She also likes how the harmonium sounds like the accordion in such a way as to cause a physical experience of the synonym in the root terms: accord and harmony. If you have yet to check out guest blogger Damien James be sure to see his preview of the Chicago Humanities Festival. With Halloween nearly upon us, I am often thinking of costumes and lately most disruptively of clowns. I’ve been surprised how readily my mind keeps returning to clowns. How they have figure into costumes for hundreds of years that we know of and are still a prominent if somewhat nostalgic theme in entertainment and fantasy. Clowns have been on my mind since coming across an installation of clowns in an unlikely shop window. Though I don’t suffer to any degree from coulrophobia, I can’t seem to shake the image of terrible clowns in torn-up designer clothing. The Marc Jacobs Halloween window display is haunting my thoughts. I first saw this window display on a recent walk down Damen Ave., in the Bucktown neighborhood, where Marc Jacobs Chicago is located. Occupying the whole front corner of the store are 7 of the most decrepit yet best dressed clowns I’ve ever seen seeming to mill about a dilapidated carnival ground, a partial Ferris wheel painting completes the setting. 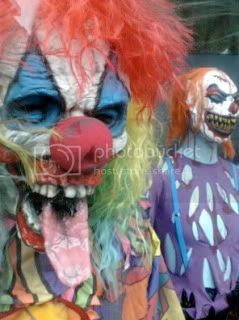 None of the clowns in the display are friendly or silly or even sweetly sad, these clowns are the scary kind the ones we make horror films about and read biographies of John Wayne Gacy to better understand. They are truly creepy. 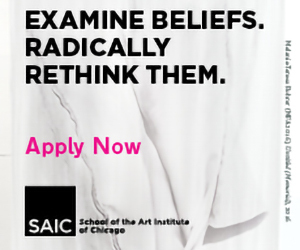 Choosing to dress-up mannequins to seem as people dressing up as designer clad clowns is a fantastic, seemingly self-conscious, nod to self-reflexivity from a place of authority in fashion and retail capitalism. Though window displays don’t usually rank in my visual and intellectual experience this one sparked a little curiosity into some of the examples of artists using clowns in their work. Though the place for clowns in art is often right next to the velvet paintings and kitsch collectibles. Clown Torture a video installation by Bruce Nauman, in the Art Institute of Chicago’s Modern Wing, where the clown is not something that comforts or entertains but berates himself from all angles at loud volume obsessively repeating and correcting jokes. In 2003 Cindy Sherman started using clowns in her portraits, they are eerie images with extremely saturated colors. Sherman posing as an elaborate clown in each image, it is much the same as her other work with portraiture and in many ways a surprising continuation of her previous themes rather than the startling change it at first seems when, as the viewer I was first confronted with these antagonizing yet bright, almost playful images. That same year, 2003, the Andy Warhol Museum in Pittsburgh devoted an entire exhibition to clown paintings from the collections of Diane Keaton and Robert Berman. 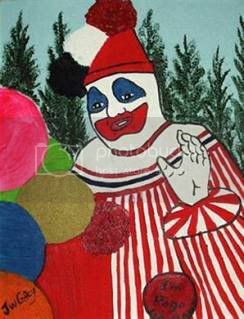 Between them they have amassed thousands of clown paintings that typify this genre. The show met with mixed reviews and I have not been able to find an instance of its duplication. Since 2003 there are fewer major instance of clowns being used in contemporary art, but to my mind the Marc Jacobs window installation supplies a fantastically creepy visual experience. If you have not been past the Marc Jacobs window I highly suggest the field-trip. Killer clowns from outer space, always creepy and a bit silly. I feel like Mathew Barney has done something with clowns as well, hmmm. The seminal movie Killer Klowns from Outer Space was awesome! The Dickies soundtrack is a true classic.